This mine once had a four foot high opening. The metal door was probably torn off by flash floods. Primary Mineral: The New Tunnel on the east side of the canyon was an unsuccessful water tunnel. 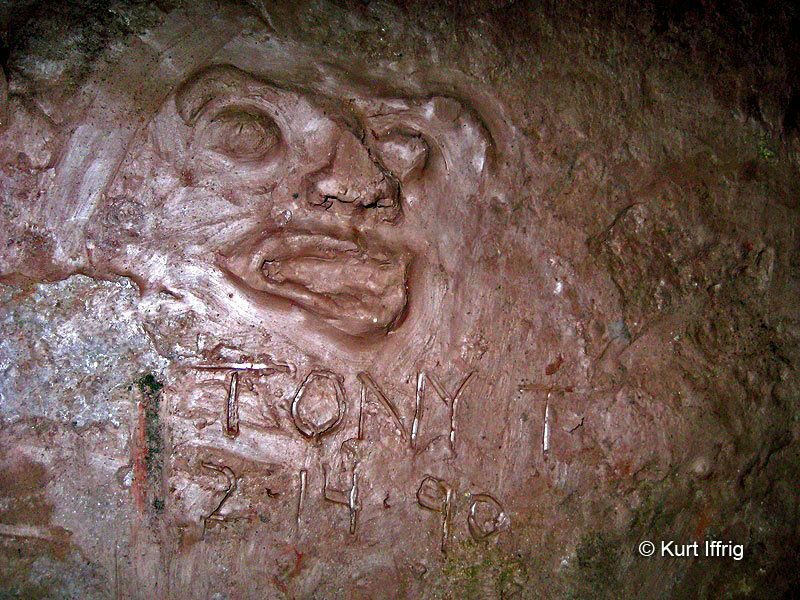 Tunnel Number 2 on the west side was also a water tunnel, but may have also been a gold mine back in the 1800's. Years of Operation: The tunnel on the right wall is engraved with 1934 above the portal. 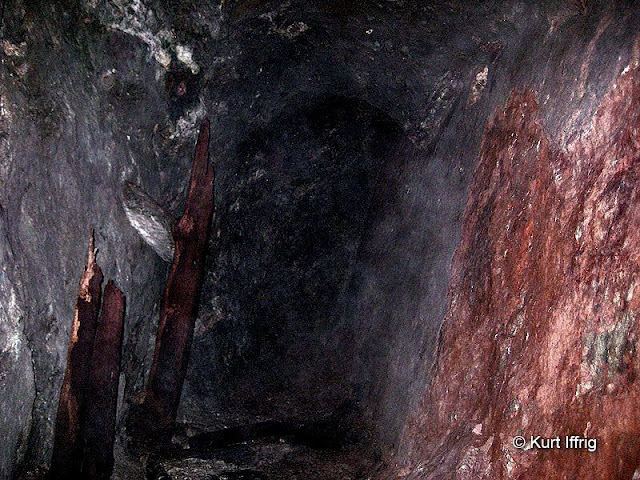 The mine on the left wall was used as a water tunnel around the same time, but may also be an old gold mine that dates all the way back to 1877. Depth: The New Tunnel is approx, 238 feet, right fork is about 30 feet. Tunnel Number 2 is locked and could not be measured. My water map shows that it is about half the depth of the New Tunnel. Looking out toward the opening. Behind me the mine forks to the left and the right. 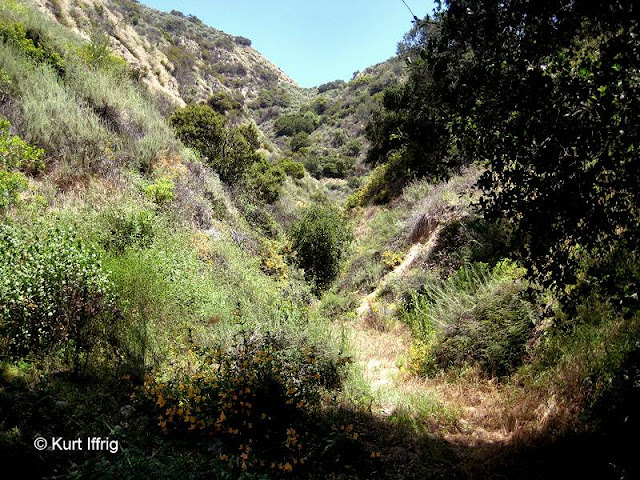 Rubio Canyon is located between Las Flores Canyon and Pine Canyon above Altadena. 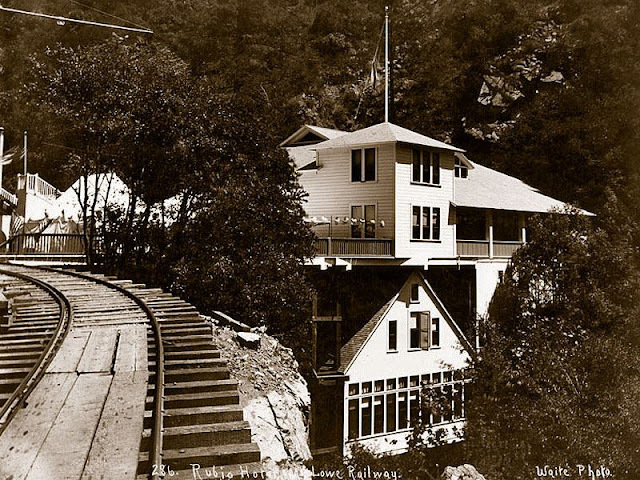 It was once the gateway for the Pacific Electric Line that transported well to do tourists through the canyon to the Rubio Pavilion, where they disembarked and boarded a steep incline rail that took them up Echo Mountain’s east side, eventually stopping at the White City. Echo Mountain was the starting point of the Alpine Line, an amazing tour that looped through the rugged San Gabriels for a three mile tour. The Mt. Lowe Railway opened in 1893, and in it’s heyday featured four hotels, a petting zoo, the world’s largest spotlight, four star dining, the famous Alpine Tavern, and even a small observatory. Although it catered to the rich, it never made a dime, and was completely destroyed by natural disasters, as was the Rubio Pavilion. There's something interesting and unsettling in this photo. Just above the rusty bucket is a clear bear track. It took a bit of research to find out out the names of these mines. The one you see in the photos above and below is called the New Tunnel, and there’s another locked one on the opposite wall called Tunnel Number 2, also known as the Dump Tunnel. They were both water tunnels. Tunnel Number 2 runs directly under the old Right of Way Trail, the exact route that once brought trains into Rubio Canyon. Downstream from these two tunnels is another one still used by the water company, called Tunnel Number 1, or the Carter Tunnel. It is heavily fortified by fencing and a cement barrier. Upstream is yet another, which to the best of my knowledge has never been found. That one is called the Del Tunnel. The tunnel featured on this page was abandoned by the water company when it failed to produce water. 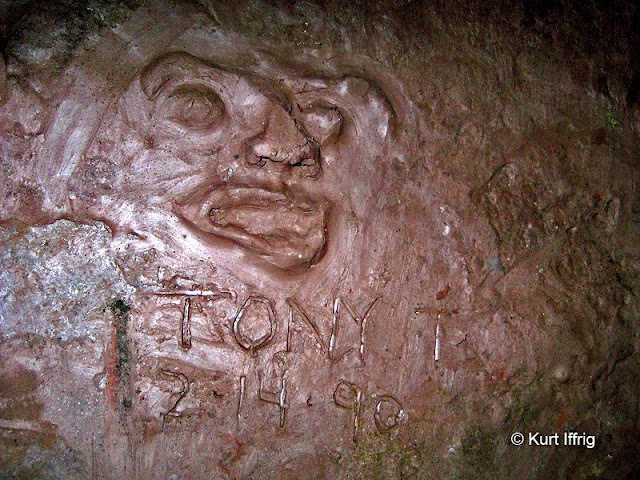 In 1990 Tony T sculpted a face out of natural clay in the mine. 26 years later it was still in good shape. 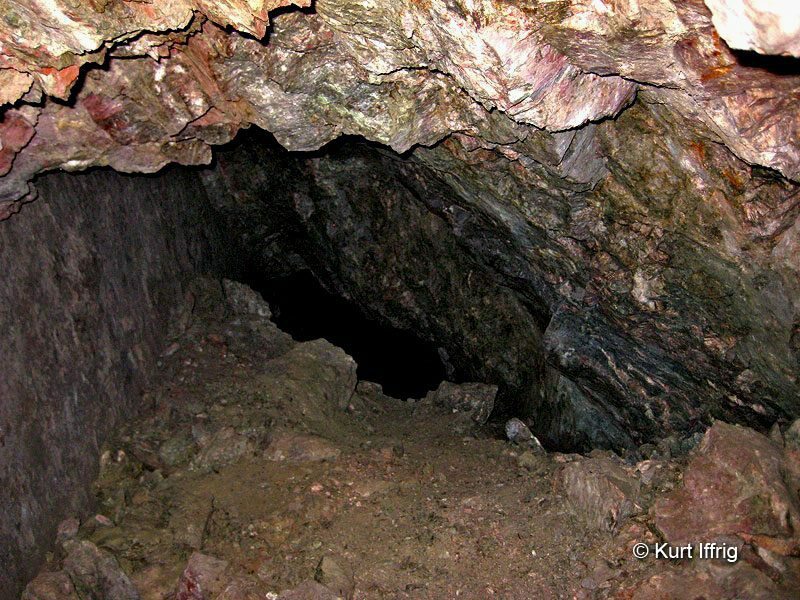 The New Tunnel is the only "known" open mine in Rubio Canyon. Over nearly a century its portal has narrowed from four feet to less than 18 inches. 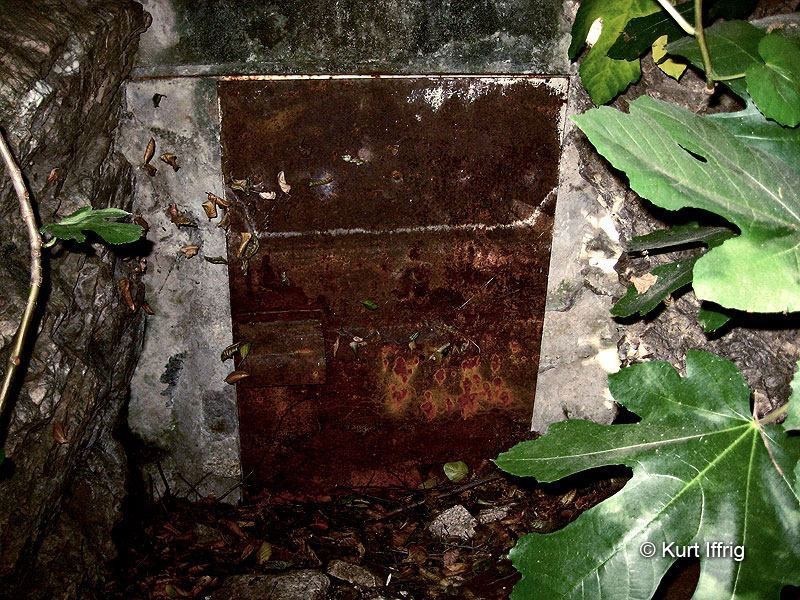 If you look carefully at the first photo on this page you can see the top of the metal door that once covered the opening, sticking out of the dirt. This is one of the more dangerous mines I’ve entered, but not for the reasons you might think. Although entry requires a short crawl, the mine opens up immediately after you get past the cement lip. The entrance is very unlikely to cave in. It’s reinforced by both cement and a line of metal bars. This is neither a wet mine or a dry mine, it’s moist, meaning muddy and moldy. Mold is something you do not want in your lungs, it causes all kinds of health problems including cancer. For that reason I always wear a dust mask in these types of tunnels. Aside from a major cave-in in the left fork there are other hazards in this mine. At least one bear has been in here. 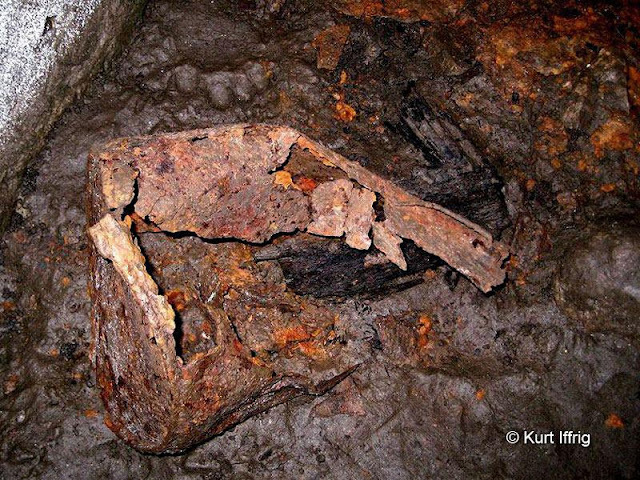 You can see the print of his forepaw in the photo of the rusty bucket. Also there are a number of spiders on the walls that may or may not be brown recluses, or violin spiders. There is a major cave-in halfway through the left fork. However it is still possible to climb over. This is a forked tunnel. The right fork is relatively short and very muddy. The left fork is much deeper. It goes in straight, then bends to the right, with a massive cave-in along the way, approximately a 90% closure. This tunnel has an interesting geological feature that I’ve never seen in another mine, which may explain the slipping of the rock that caused the cave-in. One wall is almost perfectly flat, yet there are no drill or chisel marks. But how is this possible? It turns out the rock along the right wall is called Slickenside, a smooth surface caused by frictional movement between rocks along two sides of a fault. In other words, this mine was probably built directly on an earthquake fault. The left fork will likely be completely sealed at the cave-in point sometime in the future, but I decided to take a chance and climb over it to get to the end of the tunnel. I highly recommend against this, but curiously got them better of me this time. Against my better judgement climbed over the cave-in to get to the end of the left fork, and here it is. This is an interesting tunnel. The water map I acquired clearly shows it as a water tunnel, built into the west wall of the canyon. However, going back much further in history, this may have also been a gold mine owned by the Woodbury Brothers, who founded Woodbury Ranch, which would later become Altadena. The Woodbury Mine was dug into the west bank of Rubio Canyon in 1883, after the claim was purchased from Jesus Rubio in 1877. 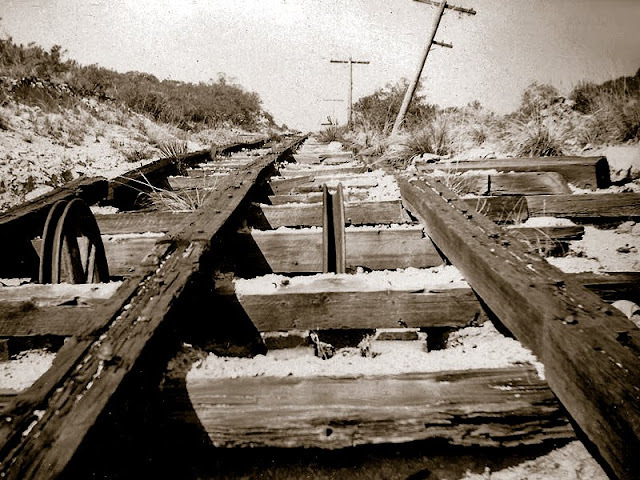 It ran directly under the path used by the Pacific Electric Railroad to bring passengers to the Rubio Pavilion, now known as the Right of Way Trail. 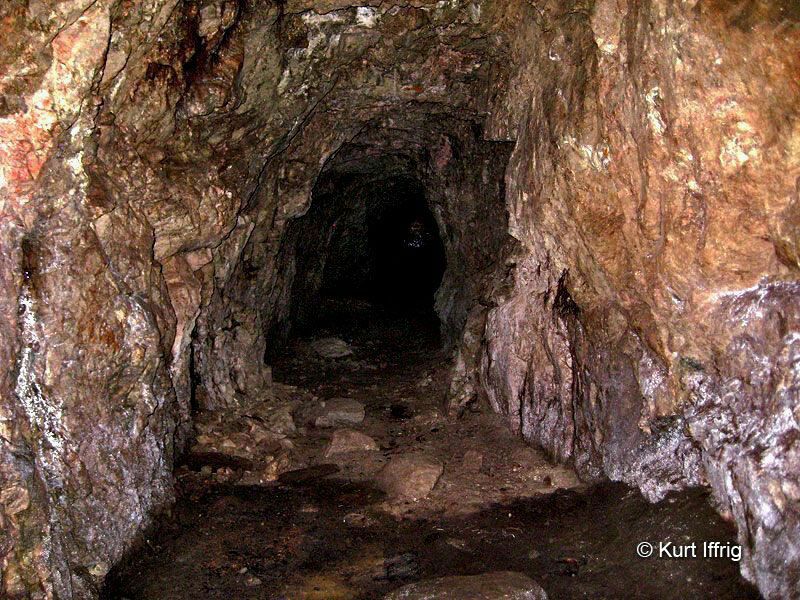 Converting old gold mines into water tunnels was not an uncommon practice, so it is likely “but not certain” that the Woodbury Mine is also Tunnel #2. Without a key I cannot access this tunnel, but if that changes in the future I will post photos of this mine. This is Tunnel #2. It's locked, but an old water map indicates it used to run under the Pacific Electric railway. Rubio Pavilion was built in 1893 and was sadly destroyed in 1909 by a natural disaster. Less than an hour’s ride from downtown Pasadena, it was once possible to enjoy lunch in the dining room of the Rubio Hotel, which accommodated 80 diners. On opening day, which was July 4th, 1893, the Pavilion was illuminated with 2,000 Japanese lanterns. Professor Thaddeus Lowe had spared no expense to make it a memorial event. The elegant Incline Station was surrounded by a forest of sycamore, live oak and ferns. Rubio Pavilion had three floors, spanning the narrow gorge directly above the streamed. Over one mile of planked walks and stairways with more than 1000 steps led to nine beautiful waterfalls of Rubio Canyon. The Pavilion was at the lower end of the Rubio Incline, where passengers experienced a thrilling ride up a 59% grade in open air “White Chariots” that led to the top of Echo Mountain. The old Rubio Pavilion. From here tourists would transfer to the incline for a steep ride up Echo Mountain. During 1909 a late winter electrical storm created a landslide that rolled a huge boulder down into Rubio Canyon crushing the Pavilion. Unfortunately, the Fred Drew Family, the Pavilion caretakers, had come up from their Pasadena winter home a little too early and were trapped under the rubble of the Pavilion. Daughters Helen and Dorothy had escaped injury and were able to get the incline car up to Echo where they called for help. Rescuers from Echo and Pasadena found Mr. Drew pinned under some timbers and nearly drowning under the rising water. Three year old George Drew was found suffering from a concussion and a broken hip. Mrs. Drew was found twelve hours later dangling by her skirt from a pipe unconscious and unnoticed. Thayer Drew, their five-year-old boy, was not found until next morning. He had attempted to rescue his dog and cat, and that's where they found his body, buried in the wreckage with the two animals in his arms. Left: The Great Cable Incline going up Echo Mountain. Right: Staircases allowed tourists to see nine falls. 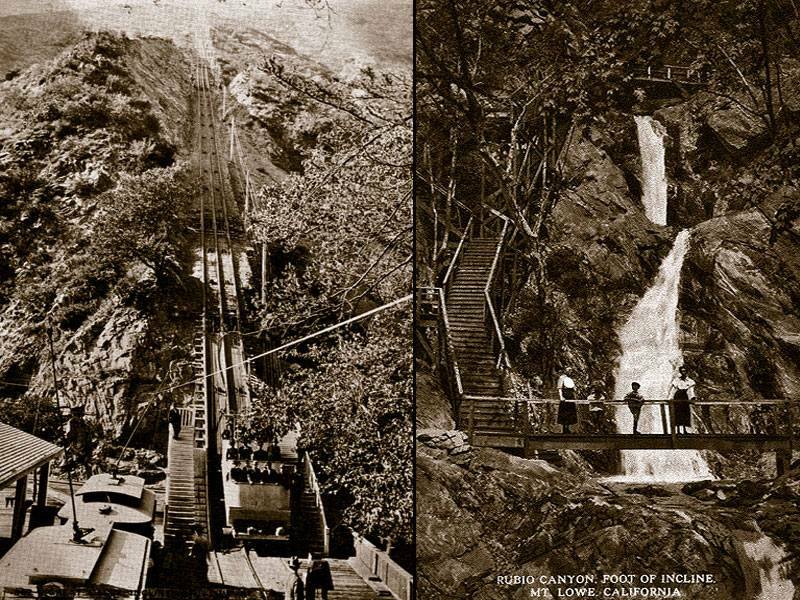 The Great Incline or Mountain Elevator (pictured above) was about 2,590 feet long and rose 1,238 feet in elevation from 1,954 feet at Rubio Canyon to 3,192 feet at Echo Mountain. The incline started out at a slope of 57 percent and increased to almost 62 percent before dropping back to 52 percent and finished at 39 percent at the top. Because of the two major bends in the incline, you could not see the top from the bottom, or the bottom from the top. This meant that the passengers on the incline cars could not see the other car until both cars were near the passing tracks at the center turnout. After they had passed at the turnout they would again lose sight of the opposing car as the car traveling up went over the bend and onto the 52 percent grade. Little remains of the Rubio Pavilion today. Most of the structure was wiped out by a storm in 1909. Most of the Rubio Pavilion and the Great Incline are long gone, but you can still see bits and pieces of the foundation that supported both. In fact, there’s a monster sized boulder broken into several pieces at the bottom of the stream bed that may be the same one responsible for destroying Rubio Pavilion. Massive chunks are somewhat buried in the dirt and brush, but it looks as if the oblong boulder may have been as long as 30 feet long before it broke into pieces. Most people who visit the ruins of the White City atop Echo Mountain take the Sam Merrill Trail from the next canyon over, but next to the Rubio Pavilion ruins there is a far more interesting trail that follows the exact route of the Great Incline called the Incline Trail, built in 1892. On the way up this steep trail, you can still see many of the stone walls that supported the rails. The Incline Trail takes you up the eastern side of Echo Mountain. It becomes overgrown and hard to follow near the top. At least it was the last time I hiked it. This unmaintained trail dates back all the way to the 1800s, but is well worth taking. West of the Pavilion ruins is the steep Incline Trail. You can still find many old stone supports on the way up. 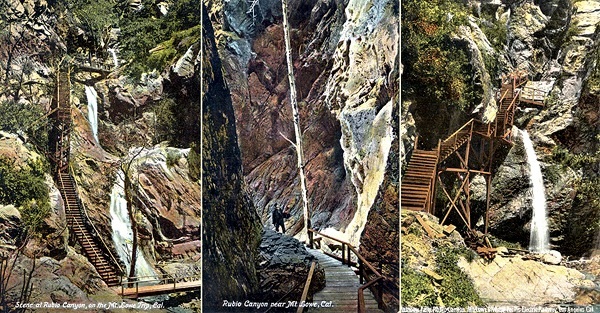 Colorized postcards showing the amazing staircases and walkways that once led to nine waterfalls. Maidenhair Falls, 17 feet high - named from the abundance of maidenhair ferns growing on its rocks, Cavity Chute Falls, 9 feet high, Bay Arbor Falls, 12 feet high. - named from a clump of bay trees nearby and under the footway passes, Ribbon Rock Falls, 36 feet high, Moss Grotto Falls, 33 1/2 feet high, Grand Chasm Falls, a double-leaper of 33 and 15 feet, making the entire falls 48 feet high. This fall was located at the outlet of a towering, narrow gorge called the Grand Chasm; and at the crest of these falls there was a stone dam which formed a reservoir called “Mirror Lake,” from which water was piped down to the pavilion to run electric dynamos, printing presses, and for general uses. Heavy plank stairways led up across the face of the falls, and a bridge led over the lake through the Grand Chasm. Lodged Boulder Falls, 12 feet high. 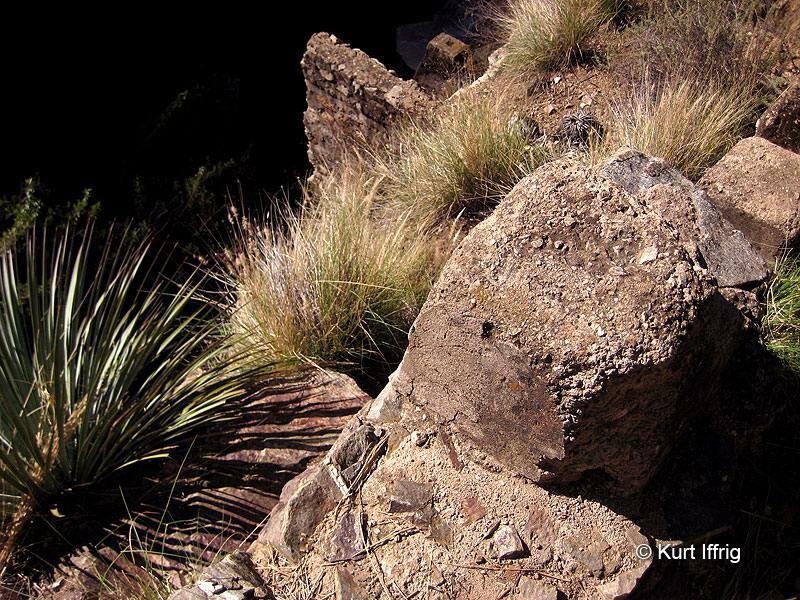 Professor Thaddeus Lowe once stood on the “lodged boulder” from which this fall is named and made a speech to a large group of Pasadena visitors, gathered on the canyon stairway, July 1, 1893. This historic scene was photographed and was widely publicized. Roaring Rift Falls, 23 feet high - the noisiest of the whole series. Thalehaha Falls, 112 feet high. The name is an Arizona Indian word, meaning “white water,” and was given to it by Prof. G. Wharton James, editor of the Mount Lowe Echo. Measurements of these falls were made in the summer of 1893 by Dr. Hiram Reid, while studying the geology of Mount Lowe’s system of peaks and canyons. Beyond the falls mentions above was Thelehaha Falls, which was only accessible by winding footways down from Echo Mountain. There were other falls and dells in this area, most notably Rainbow Dell and Leontine Falls, named by the editor of the Mount Lowe Echo. Today Rubio Canyon is dry, the walkways are long gone, and most of the falls are inaccessible except by down climbing with ropes from above. The upper canyon is truly spectacular, though few will ever see it. These are remnants of Rubio Pavilion's upper deck. In 1909 it was destroyed during an electrical storm. 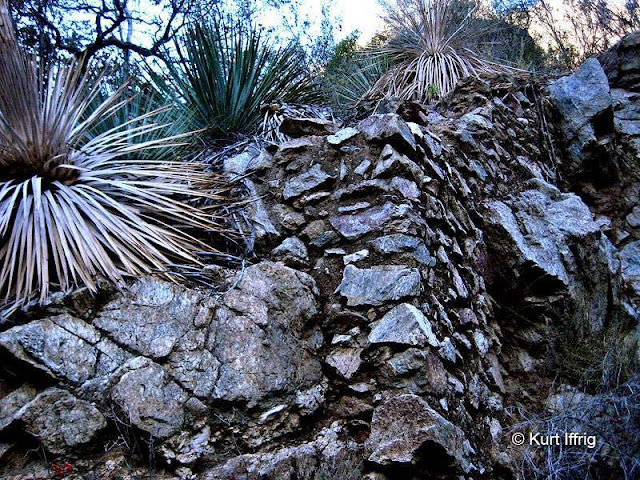 From 1884-1886 a long forgotten water tunnel was dug, running roughly west to east between Rubio and Pine Canyons, through a passage known as Dry Canyon. This was billed as one of the greatest engineering marvels of its time in California, eventually reaching a depth of 3000 feet. It was a valiant effort to find irrigation water for the groves of Altadena, but in the end it was a complete and extremely expensive failure. The Union of June 4, 1886 said of it. “It costs a mint of money and a vast deal of pluck to make such a colossal experiment.” True; and sad to say, it was an entire failure at last - a dry tunnel, waterless and worthless; yet the persistence in pushing it to a finish was truly heroic, and no man could have told in advance that little or no water would be found. It was made by David Dolben for I.M. Hill, S.L. Porter and Dr. George M. Bergen, owners of the land there. A few inches of water flow in the upper section, but it all sinks away long before reaching the mouth of the tunnel. Somewhere below Dry Canyon this tunnel still exists, though the entrance has long be sealed and buried. The tunnel was reportedly three feet wide at the base, narrowing to twenty inches at the top and five and a half feet tall, complete with wooden braces and three vertical ventilation shafts along the way. Two more shafts were planned before the tunnel was finally abandoned. A view of Dry Canyon looking east. 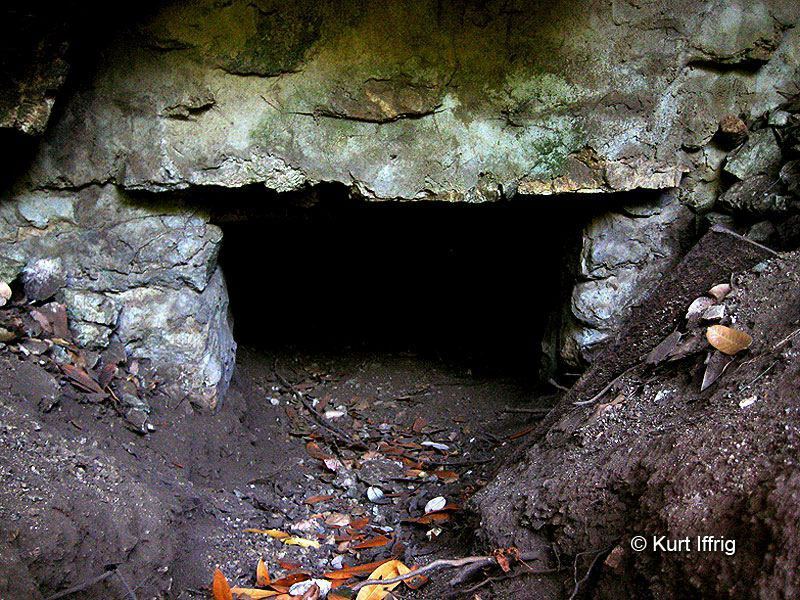 This was the site of the longest water tunnel in Los Angeles County. Near the base of Rubio Canyon there’s a strange, abandoned log cabin, in an advanced state of collapse. This structure is a holdover from the old Camp Huntington Boy Scout camp built in 1920 by none other than Henry Huntington. Huntington was a wealthy railroad magnate and a major booster for Los Angeles in the late 19th and early 20th centuries. The camp operated until 1960, when it finally closed. Further up the road there’s a foundation of an even older cabin that was the Boy Scout clubhouse. One year there was a torrential storm that flooded it, practically up to the ceiling, and it was deemed unsafe. 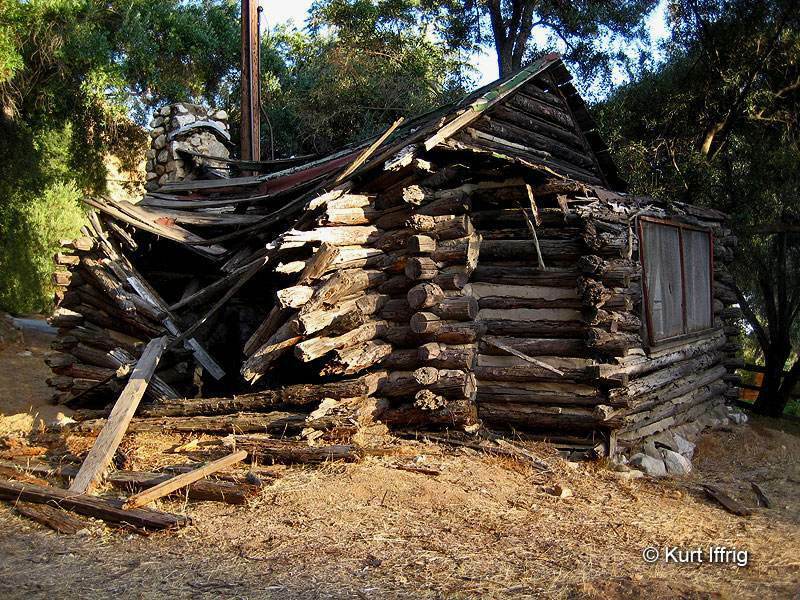 Since 1960 the log cabin has remaining in limbo, slowly falling into ruin. Houses have been built around it, but the cabin has neither been destroyed or repaired. Just one more strange and historical remnant of Rubio Canyon. 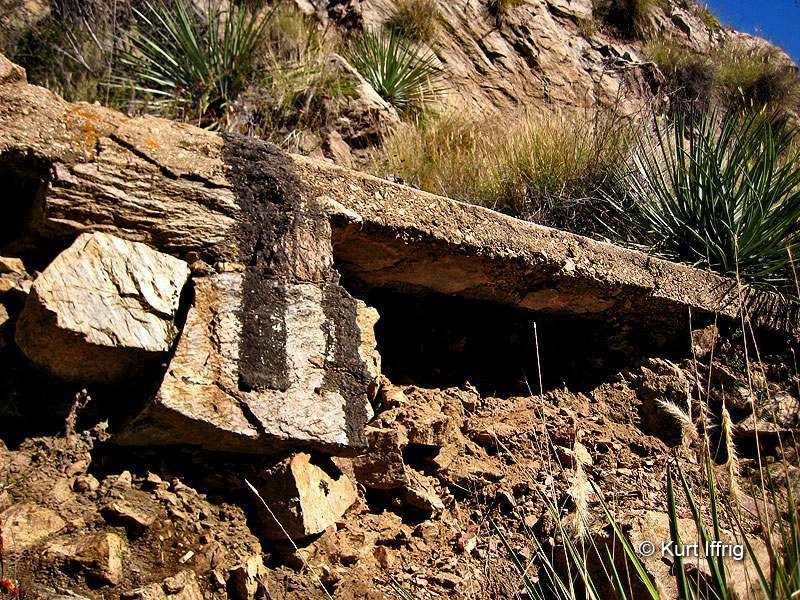 At the mouth of Rubio Canyon there is a strange, abandoned log cabin that has partially collapsed. 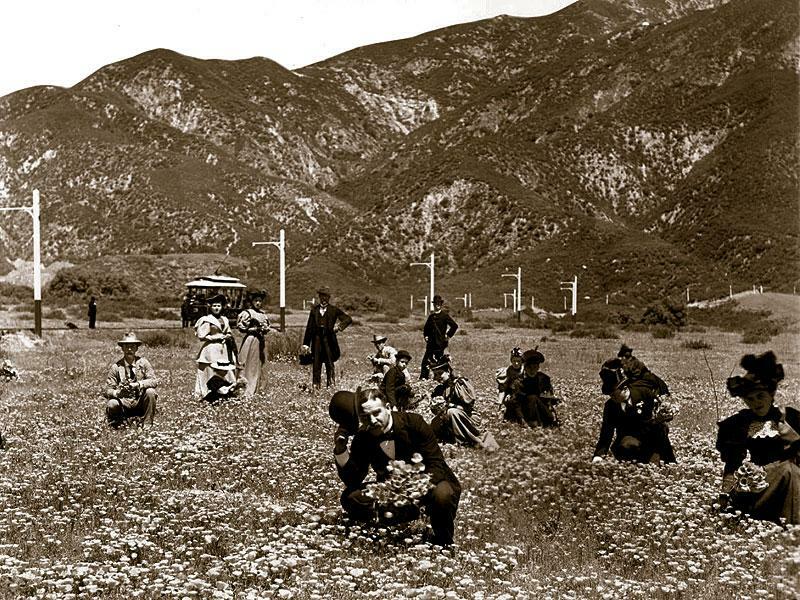 In 1895, Altadena was a giant poppy field, with flowers so colorful that sailors claimed they could see them from the coast. Some even said the poppy fields helped them navigate into a coastal harbor. The photo below was believed to have been taken around the area where Woodbury Road intersects with Lake Avenue. The land was owned by the Woodbury Brothers, who may have also owned Tunnel Number 2 in Rubio Canyon. The name of the city Altadena came from Byron O. Clark, who had established a nursery in the foothills in 1875 and had named it the “Altadena Nursery”, a name he coined from the Spanish “alta” meaning “upper” and “dena” from Pasadena. The Woodbury brothers asked if they could use the name Altadena for their subdivision. and Clark agreed. Altadena was once a big poppy field. This photo was most likely taken near Lake St. and Woodbury Rd.